We’re all familiar with the QWERTY style keyboard. In fact, we’re so used to this style of keyboard that the QWERTY keyboard has become ubiquitous within North America. When we think of a computer keyboard, we think of a QWERTY keyboard. This style of keyboard has a long history, having been initially designed for analog typewriters in 1878. To this day, that design remains virtually unchanged, except for the addition of some computer-based function keys, and some other minor changes. The product that we’re going to be looking at today isn’t just a departure the QWERTY style, it’s the antithesis of modern keyboarding as we know it. Tap is a wearable, Bluetooth enabled keyboard and mouse that allows users to input text using any surface, with just one hand. 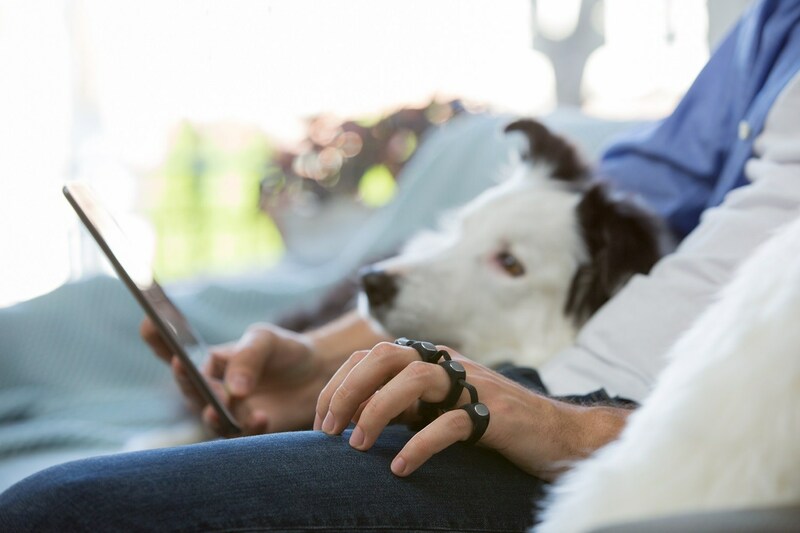 The Tap wearable keyboard is customizable, accessible, and ergonomic, and it’s supported by a multitude of apps that allow users to learn and customize their device. The Tap wearable keyboard (and website) was designed with accessibility in mind. Because the Tap device also functions as a mouse, users with limited mobility are able to control their text and mouse input using just one hand. Having been also designed for users with visual impairments, Tap supports Apple’s built-in VoiceOver capabilities, and VoiceOver users can use taps for the most commonly used VoiceOver functions. To check out the accessibility section of the Tap website, click here. In addition to that, a general .pdf glossary of taps has been made available for download here. To download the list of VoiceOver-specific taps, click here. Tap also supports a web-based utility that allows users to create and upload custom tap layouts (known as TapMaps). Not only are users able to share these layouts online, they can also explore existing TapMaps. TapManager – Allows users to setup, update and manage their Tap device. TapGenius – This learning system breaks down the alphabet into 8 tap sets using musical and visual memory. TapAloud – An audio-only version of TapGenius. TapAcadamy – Gamifies tap skills and allows users to improve and perfect their tapping abilities.